Though Eva Mattes netted a much-deserved supporting actress awards at Cannes for surviving opposite Klaus Kinski in “Woyzcek” (1979), Werner Herzog has never been known for his strong female characters, nor should he be. Yet in a filmography consisting of delusional conquistadors, doomed rebels, vampires, African warlords, and Nicolas Cage, perhaps the most unforgettable (and certainly the most overlooked) Herzog character of all is Fini Straubinger, subject of the extraordinary documentary “Land of Silence and Darkness” (1971). After suffering a bad accident at the cusp of adolescence, young Fini lost first her sight and then her hearing, and wound up spending the bulk of her adulthood bed-ridden and cared for by an overtaxed mother. She describes an isolation that is virtually... indescribable: “I prayed, but it wasn't any use.” Despite seemingly overwhelming obstacles, Fini was able not only to get out of bed, but to connect to the world once again as an ambassador to Germany's woefully underserved deaf-blind community. 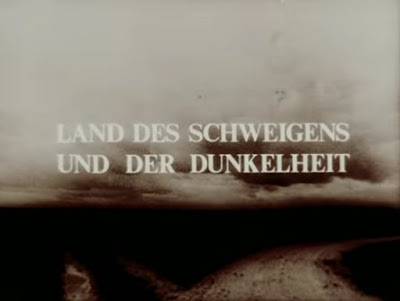 Herzog's unique deployment of Kinski and other wild animals dominates the discussion of his films of this era, but some of his earliest obsessions revolved around atypical modes of vision and communication. In the otherwise standard-issue documentary “The Flying Doctors of East Africa” (1970) Herzog is amazed by the distinct ways in which villagers in Tanzania and Kenya process (or do not process) two-dimensional images, and he has been mesmerized by the “extreme language” of cattle auctioneers, fire-and-brimstone preachers, and even characters who struggle to speak at all. “Land of Silence and Darkness” embodies these concerns as vividly as any of his films. Fini speaks quite articulately, but needs an interpreter to relate questions to her by means of the tactile alphabet, an intricate system of taps applied to fingers and palms. 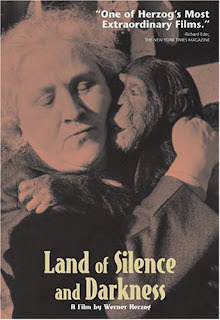 Much of the film strives to evoke a tactile experience for the audience; visits by groups of deaf-blind people to zoos and gardens form some of the most memorable scenes as they thrill to embrace baby chimpanzees or run their fingers over cacti (much safer than it may sound.) Fini also describes how deafness and blindness are not, in fact, the complete absence of sounds and images, at least not as she perceives. Having been almost mature before losing her sight and hearing, Fini is uniquely capable of interacting with many other deaf-blind people, many of whom live in heartbreaking conditions, some thrust into mental asylums only because the state provides no other care for them. 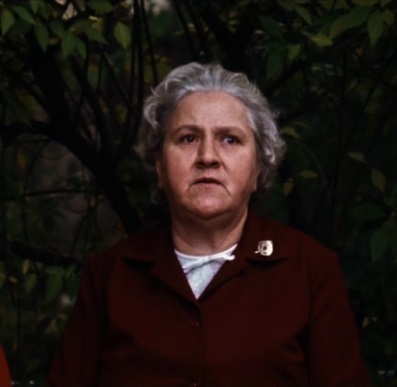 Later in the film, we meet younger people who have been deaf-blind from birth, and the possibility of communication with them remains far more tenuous. A young man named Vladimir achieves his most intimate interaction with the world by hitting himself in the face with a ball and clutching to a radio whose vibrations he can feel. Fini works determinedly to reach Vladimir nonetheless and her gentle ministrations with him will touch the heart of any viewer. There's a certain mystery generated by capturing images of people who will not have access to those images, and when we see a deaf-blind woman sitting on the edge of a hospital bed with her hands steepled in prayer it feels as if we're being granted access to an experience far more private than cinema usually achieves - “too real” even for documentary, a genuinely sublime moment. A shot late in the film when a man wanders off from an interview and winds up embracing a tree is one of those unplanned poetic images that Herzog has always had an uncanny knack for finding. Again and again, we return to the amazing Fini, a tireless advocate for the disenfranchised. Herzog has a penchant for futile causes, often mining them for irony, but if he senses there is something irredeemably lonely in this land of silence and darkness (and perhaps hopeless for poor souls like Vladimir) he is so gobsmacked by Fini and some of the people she encounters, he delivers no cosmic punchline, only admiration and the tacit acknowledgment that perhaps even the grand Bavarian poet has proven inadequate to articulate the immensity of Fini's experience. But getting somewhere close is an impressive achievement by any standard. 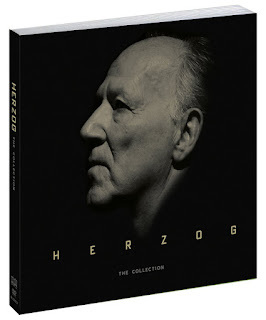 This is Herzog in full celebratory mode, and when Herzog comes to sing his subject's praises, he holds nothing back. The high-def transfers in this huge Shout! Factory Herzog set (see details at Amazon) are all pretty much similar, competent but somewhat underwhelming compared to the competition. Nothing wrong here, but nothing impressive either. It's certainly an upgrade over the shaky New Yorker DVD release of 2005, though it appears to be taken from the same source. The film is presented in its original 1.33:1 aspect ratio. Just fine for the job at hand. Optional English subtitles support the German audio. I first met Fini Straubinger about 15 years ago through this film, and I've thought about her often since. What a woman. And what a documentary.